Italian Wine, Food and a Book! I am hosting a special Italian wine and food class on Friday, May 2 at I Monelli Pizzeria (5019 N. Western, Chicago. This will be an intermediate class on pairing Italian wines and food (though beginners are certainly welcome) - and what better way to learn about this subject than by hosting it at a trattoria! We will try five or six wines, paired with several dishes off the menu, ranging from calamari to antipasti to pastas. The wines will be a range of products, from sparkling to white to red and will include Prosecco (sparkling), Greco di Tufo (white) and Taurasi (red). These last two wines are both from the Campania region; I'm choosing these, as the proprietors of this restaurant are from that southern region and these are two excellent wines that work beautifully with their food and deserve greater attention. 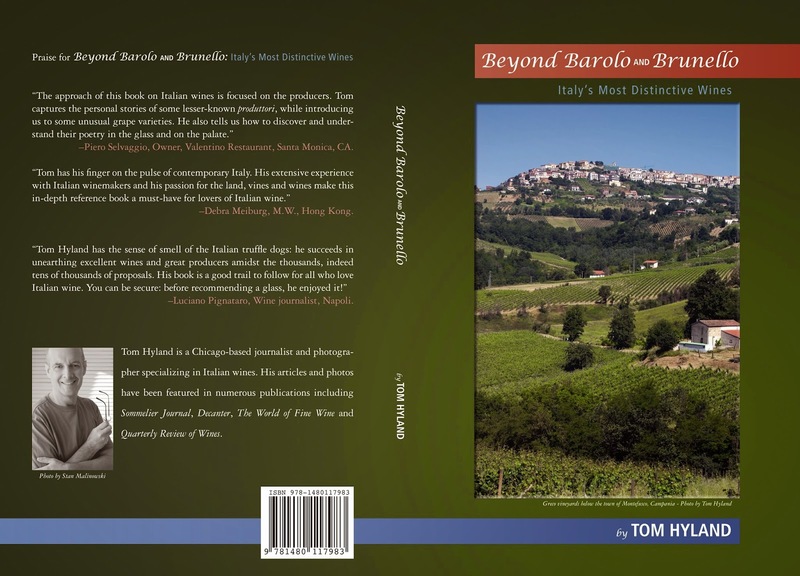 As a bonus, everyone who signs up will receive a copy of my book Beyond Barolo and Brunello: Italy's Most Distinctive Wines, which details more than 600 wines from Italy, covering all of the country's regions. Having made more than 60 trips to wine regions in Italy, I wanted to showcase hundreds of the finest wines from Italy, not just the most famous reds (such as Barolo, Brunello and Amarone), but also excellent examples of typical and delicious Italian wines such as Dolcetto, Gavi, Verdicchio and Montepulciano d'Abruzzo. So there you have it - several excellent Italian wines, first-rate Italian cuisine and a copy of a through book on Italian wine, all for a total of $55 a person (the book itself is a $24.95 value). There will be limited seating for this, to ensure everyone gets enough wine to taste, so you need to sign up soon. To enroll, please email me at thomas2022@comcast.net. I can then tell you if there is still seating available. Payment is due up front (I will give you payment instructions in the email) and is due by April 27. The dinner starts at 7:00 PM and will run to approximately 8:30. I hope to see you on May 2 for a great evening of Italian wine and food! I admit it - I'm in love with Champagne. And why not? Each to his own, but I don't understand people who don't care for Champagne. But I don't have the time to argue with them - either you love it or you don't. And as a friend of mine likes to say, well if they don't like it, that means there's more for you and me! I attended a small Champagne tasting in Chicago the other day; I'll go to any Champagne tasting, but I love the small ones, as it doesn't overwhelm you and it gives you time to talk to the proprietors. This tasting featured ten small producers, many of whom are recoltant-manipulant - producers that grow their own grapes. These small houses are the backbone of Champagne and each producer has an intriguing story to tell; they are all part of a membership called Les Champagnes de Vingnerons (website here). 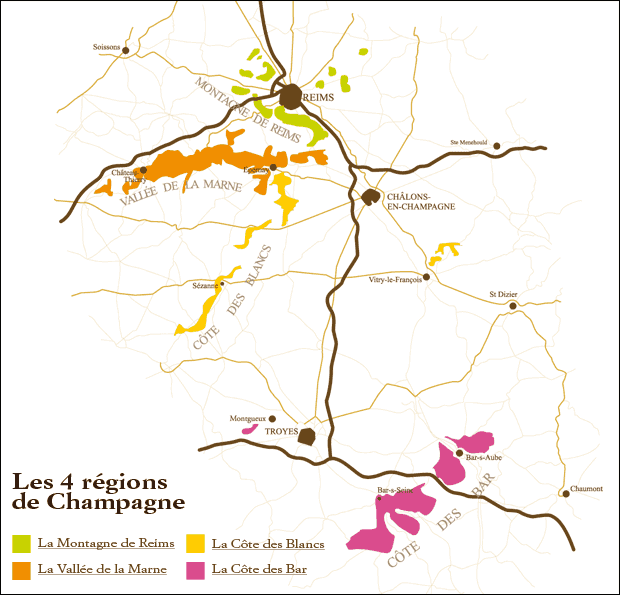 The ten producers represented the four regions of Champagne: La Montagne de Reims; La Valle de la Marne; La Cote des Blancs and La Cote des Bar. Some of the houses use grapes only from one region where their winery is located, while others blend grapes from two or three of these regions in particular cuvées. Each producer poured at least four wines, some as many as six or seven, ranging from Rosé to Blanc de Blancs to Extra Brut. Champagne Benoit Cocteaux - This small house is situated in the southern part of the Cote des Blancs in the town of Montgenost. As the Cote des Blancs is planted primarily to Chardonnay, this is the grape that dominates their Rosé, which was one of the finest of its type at this tasting. Their NV Rosé d'Helene (named for co-owner Helene Cocteaux) has a bright pink/strawberry color and pleasing cranberry and beet aromas and flavors. This has very good freshness and is quite elegant with a delicate finish. Georges de la Chapelle - Another Cote des Blancs property; a very fine Rosé, a blend of 35% Chardonnay, 30% Pinot Noir and 35% Pinot Meunier was excellent. Medium-full, this has beet and strawberry aromas with a round finish of excellent persistence. Another impressive wine is the Nostalgie, a blend of 70% Chardonnay, 15% Pinot Noir and 15% Pinot Meunier; medium-full, this offers notes of coffee and brown spice along with dried pear and can be enjoyed over the next 5-7 years. Champagne Philippe Glavier - Both Philippe and Veronique Glavier were present to pour their wines; they are a delightful couple that makes elegant Champagne in a delicate, charming style. Most impressive here were the Genesis, a 100% Chardonnay from Grand Cru vineyards and the Folie de Cramant; Cramant, a village in the Cote des Blancs, is the location of this house. The former is a silky Champagne with a long, round, very pleasing finish, while the latter, fermented in barrel and aged on the lees for five years, is fuller on the palate and has very good acidity and lovely complexity. This can be enjoyed over the next 5-7 years. Champagne Jean-Jacques Lamoureux - This house is located in the Cote des Bars - also known as the Aube - in the far southern reaches of the Champagne district. The wines here tend to display a charming fruitiness; though they do not tend to be as rich as the best wines from the other regions of Champagne, they are very impressive in their own right. A highlight here is the 2008 Alexandrine, produced entirely from Chardonnay. Medium-full, this has appealing aromas of lemon and lime with a distinct yeastiness. Quite elegant and charming, this is a delightful wine to be served on its own or with lighter seafood preparations; enjoy over the next 3-5 years. Champagne Boulard-Bauquaire - This house is situated in the Montagne de Reims region; this area surrounds the town of Reims in the northern section of Champagne. There were several intriguing cuvées offered at this event; one of my favorites was the Carte Noire, a blend of 50% Pinot Noir and 50% Pinot Meunier. Displaying a light copper color along with bread and biscuit aromas, this is a full-bodied wine with a light creaminess and very good acidity. I was also impressed with their Rosé, a blend of 80% Chardonnay and 20% red wine; this offered delicious strawberry fruit and very good acidity. Also their Vielles Vignes, from 70 year-old vines, has lovely pear fruit and distinct yeastiness and a dry, lightly austere finish. Champagne Gratiot-Pilliere - From the Vallée de la Marne region, a bit south and west of the town of Reims, this house offered two excellent Brut bottlings; the first, a NV Brut Tradition, an intriguing blend of 74% Pinot Meunier, 10% Pinot Noir and 16% Chardonnay. Medium-full, with pear and apple aromas, this has impressive persistence. The 2009 Millesime, a blend of 70% Pinot Meunier, 10% Pinot Noir and 16% Chardonnay, is a winner! Medium-full with excellent concentration, this has a long finish, excellent persistence and beautiful complexity; enjoy this over the next 5-7 years. 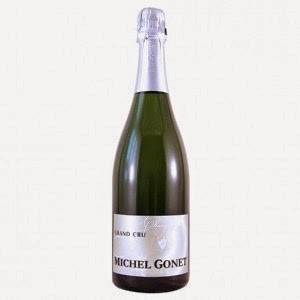 Champagne Michel Gonet - Last, but certainly not least, we have the marvelous cuvées of Michel Gonet, a house located in the Cote des Blancs. I had tasted their wines previously and have always enjoyed them; however, at this year's tasting, it seemed to me that the wines had reached even higher levels of quality. 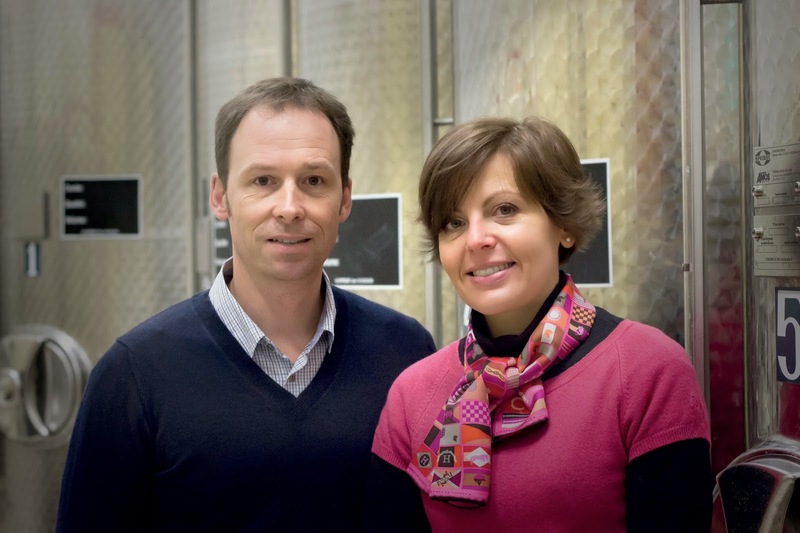 As you might expect from a Cote des Blancs house, Chardonnay is their speciality and the proprietors offered several Blanc de Blancs, usually Grand Cru. The 2004 Grand Cru Blanc de Blancs is an impressive wine with dried lemon and yeasty aromas; medium-full, this is tasting out beautifully now. Even better - and clearly among the two or three finest wines at this tasting - were the 2009 and 2008 Grand Cru Blanc de Blancs. Both wines have a pleasing yeastiness along with a distinct minerality in the finish. These are wines made from first-rate vineyards and treated with great care in the cellars; both are extremely flavorful and beautifully balanced with excellent persistence. I loved both wines, giving my preference to the 2008, which is a powerful wine, one with a rich mid-palate and a lengthy finish that goes on and on. The 2009 is first-rate, while I think the 2008 is a great wine! This is clearly a Champagne house that deserves to receive much greater attention.